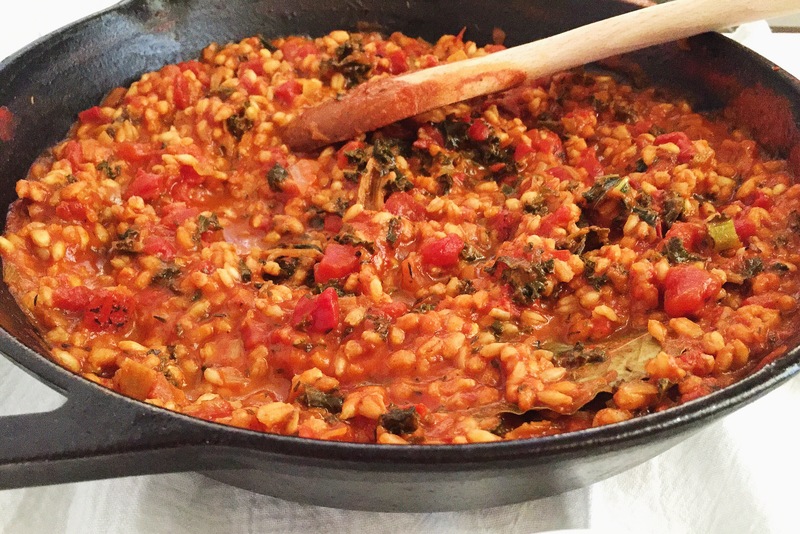 Barley Risotto with Marinated Feta – A Healthy Pinch. Let’s just start by saying I absolutely adored this dish. It’s hearty and filling and feels like a warm hug for your stomach. Is that weird? Didn’t think so. Arborio rice is found in traditional risottos, but this isn’t your traditional risotto. There’s no need to warm vegetable broth in a separate pot, ladle broth into the rice, stir and repeat. Instead, pearled barley is used and this dish doesn’t require the the meticulous preparation and exact measurements as its Italian counterpart. We just sauté the aromatics, add all the broth at once, toss in the barley, kale, tomatoes and seasonings and let the heat do it’s thing. Just a few stirs here and there. Done. Easy peasy one pot dinner. But! We can’t forget about the marinated feta. Caraway seeds may not be something you have readily available in your pantry but I love them in here, so use them if you can! I adapted this recipe from Yotam Ottolenghi’s Jerusalem using what ingredients I had on hand. The flavor profile remains in tact, though I added some kale for a pop of green, used leeks instead of celery and probably more tomatoes than originally called for. Still tastes delicious. Melt the butter and tablespoon on olive oil in a large frying pan and cook the leeks, shallot and garlic over gentle heat until soft, about 5-7 minutes. Add the barley, kale, thyme, paprika, bay leaf, lemon peel, chili flakes, salt, vegetable broth and tomatoes. Bring the mixture to a boil, then reduce to a very gentle simmer and cook for about 45 minutes, stirring frequently to make sure the risotto doesn’t stick to the bottom of the pan. It is ready when the barley is tender and most of the liquid is absorbed. Meanwhile, toast the caraway seeds in a dry pan for a couple of minutes. Lightly crush them so that some whole seeds remain. In a small bowl, combine the feta, crushed caraway seeds and 2 tablespoons of olive oil and gently mix to combine. Once the risotto is ready, check the seasoning and add more salt if needed. Divide into bowls and top each with the marinated feta, olive oil included. To bulk up the protein, add some sliced chicken on top! It’s delicious either way. I’ll definitely be giving this a go!